The AGM for the year ended 31 August 2017 was held on Sunday 18 February 2018. 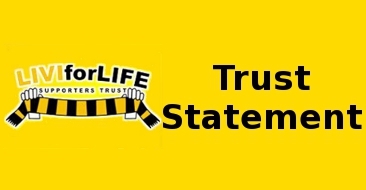 Unfortunately, we didn’t quite meet the quorum so under the rules of the Trust, the Livi For Life Supporters Trust would like to call a second AGM at the stadium on Saturday 21 April at 12:45 PM. For a number of years, the AGM has not reached the required quorum of 20 members. Whilst it is acknowledged that smaller quorums are not desirable, it is proposed that the quorum is dropped to 15 members to reduce the risk that the business conducted at an AGM will be invalid due to too few members being in attendance. The legislation governing organisations like ours recently changed from The Industrial and Provident Societies Act 1965 and Friendly and Industrial and Provident Societies Act 1968 to The Co-operative and Communities Benefit Societies Act 2014. A vote is required to formally incorporate the new legislation into the rules of the society. We have been informed that our current registered office is being sold and the Trust will need to move out. A vote will be taken to give the Trust board permission to seek new premises. Finally, as per the rules of the society, we are required to have a brass plate outside the registered office with our name. Permission will be sought to disapply this rule, should our new landlord deny permission. We would encourage all members to attend the AGM and look forward to seeing you there.